During Confirmation the ‘Spirit of the Lord’ rests on the person being confirmed in the Lord’s grace and brings forth the gifts and fruits of the baptised in a deeper way. 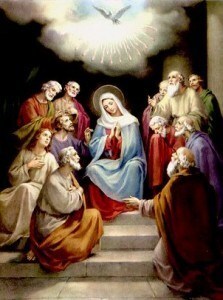 In fact, the Sacrament carries on in a certain way, ‘the grace of Pentecost in the Church’. We often think it would have been marvellous to be there in the upper room on the day the Church was born but instead we receive the same grace from the same Lord during our Confirmation. During the Confirmation service we are ‘anointed’ with specially blessed chrism oil, Christian means ‘anointed’ this is why Easter Churhes call Confirmation, Christmation instead. The Sacrament of Confirmation ‘seals’ the Baptism we may have received years before as babies and completes us to be fully formed and functioning Christians in the world. Confirmation strengthens the graces we received at Baptism and the gifts and fruits of the Holy Spirit in us.